Thermoset plastic is a synthetic polymer known for its resilience, strength and durability. It is how thermoset plastics are made and manufactured that make it an ideal material for a variety of applications across many industries. Automotive, aerospace, construction, medical, military, agriculture, and corrosion control are all such industries that utilize parts made with thermoset plastic. Though there are numerous types of thermoset plastics – polyester, vinyl ester, polyimides, polyurethane, pDCPD, and many others – there are only two classes of plastics: thermoset and thermoplastic. A thermosetting plastic product, after its initial forming, is permanent and cannot be remolded or reshaped. That distinguishes it from a thermoplastic, which after its initial heat-forming, can be remelted, remolded and reshaped without altering its chemical properties (see thermoset vs. thermoplastics). In general, thermoset products are made through liquid molding processes. The polymers and other agents are fed into tanks or barrels, where they are heated to a liquid state and mixed. Then the liquid polymers and other agents are injected into a mold cavity. As the material cools and hardens to the configuration of the cavity, it goes through a curing process where the polymers cross-link together. That process forms an irreversible chemical bond that prevents the risk of melting, softening or warping when or if the finished product is subjected to high heat or corrosive environments. This makes thermosets perfect for high-heat applications and outdoor use. 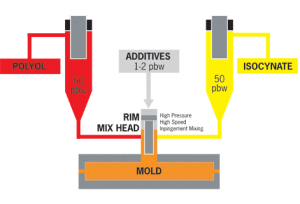 The RIM molding process begins when two liquid agents—an A-component (polyol) and B-component (isocynate)—are placed in separate tanks and heated to an elevated temperature. They are then fed at high pressure into a mixhead. Once combined, the mixed liquid flows into a mold where the chemical reaction takes place, forming a polymer in the mold. 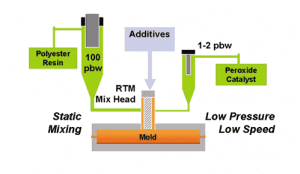 RTM is a closed-molding process also known as liquid molding. Resin formulations are mixed with a hardener, or catalyst, and injected into a mold that contains dry fibers, such as fiberglass, where the part is allowed to harden and form. As mentioned, thermosetting plastics has a number of advantages that set them apart from thermoplastics. Because of its toughness and durability, thermosetting plastics are well-suited in the production of permanent parts for a wide range of industries. Thermosetting plastics can be manufactured into all shapes and sizes, for just about any application or need. Lightweight and highly heat resistant, combined with its strength and corrosion resistance, makes thermosetting plastic parts the choice material used from automobile fenders to electronic assembly panels. Also, because of its resilience, thermoset plastics will not become weaker when the temperature increases or decreases. Contact the experts at Osborne to see if thermosetting plastic materials will work for your application.